By now surely we're all familiar with the Tory strategy of blaming others for what they're guilty of themselves. The way opportunistic Tory MPs gleefully jumped on the Labour anti-Semitism furore in a week in which their own party has been rocked by one outrageous bigotry scandal after another is a clear example of this, but perhaps the clearest example of all is the right-wing fixation with attacking the Labour Mayor of London Sadiq Khan for the consequences of devastating Tory cuts to the London police budget. After 26 year old Abraham Badu became the tenth murder victim in just twelve days in the capital, a flood of right-wingers have been desperate to cast the blame onto Sadiq Khan and the Labour Party instead of turning their attention to the unprecedented Tory cuts to police services in London. Here are some of the facts about the devastating impact of Tory austerity dogma on London policing since 2010. 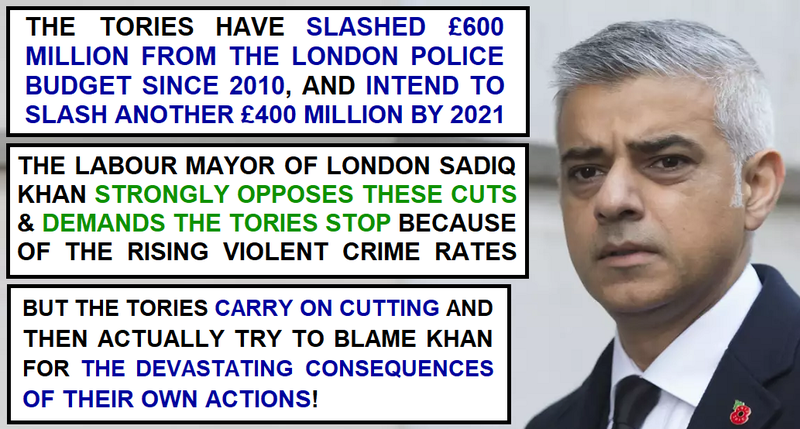 The Tories have slashed £600 million from the London police budget since 2010, and intend to impose another £400 million in cuts by 2021. As a result of these unprecedented austerity-driven cuts the number of London police personnel has collapsed by 30% from 14,330 to 9,985. Tory austerity cuts have also resulted in the loss of 65% of London's police community support officers, a reduction from 4,607 to 1,591. Tory austerity dogma has resulted in the closure of 120 police buildings across the capital, and the elimination of almost all of the capital's police counters. The reality of the situation is that Sadiq Khan has pleaded with the Tories to stop their ideologically driven vandalism of the London police force, but they've simply ignored him and carried on regardless, despite rapidly rising levels of violent crime and the increased threat of terrorism (both from Islamist fanatics and extreme-right terrorists). The Labour Party as a whole stand with Corbyn and proposed a reversal in the Tory cuts to the police budget in order to hire 10,000 extra police officers across England and Wales. Unfortunately more members of the public voted in favour of continued Tory cuts to the national police budget than for Labour's plan to reverse the worst of the cuts, so this policy will have to wait until Labour are eventually elected. The thing is that right-wingers know that a lot of people are driven by emotions rather than facts, so they're intent on pinning responsibility for the surge in violent crime on Khan because as a left-wing Muslim political leader he's a very convenient scapegoat for people with a bigoted right-wing agenda. If you don't believe the Tories would utilise lies, bigotry, and anti-Muslim prejudice for their own political purposes, just think back to Zac Goldsmith's disgusting BNP-style election campaign back in 2016. The right-wing smear merchants know perfectly well that the unprecedented Tory cuts to the London police service are a major factor in rising violent crime rates, and they know that Sadiq Khan is a vocal opponent of these police cuts. But they're absolutely intent on using emotion, anger, and underlying anti-Muslim prejudice to frame the debate about rising crime in the capital so as to turn Khan into the scapegoat. The really sad thing is that significant numbers of people are so gullible and easily led that they'll actually believe the ludicrous reality-reversing propaganda that the guy who actually campaigns against the £1 billion in Tory cuts to the London police budget is ultimately responsible for the rise in violent crime. 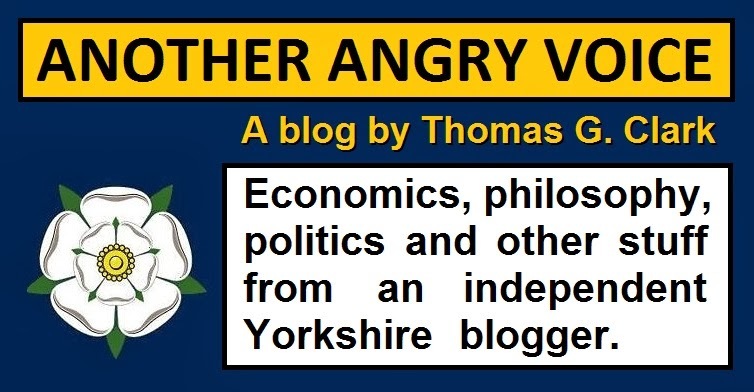 If this kind of fundamentally dishonest reality-reversing propaganda wasn't effective at convincing a significant number of people to blame an opponent of Tory austerity dogma for the horrific consequences of Tory austerity dogma, then the Tories and the right-wing press simply wouldn't use it would they? But on the bright side, Londoners were smart enough to reject the lies and Islamophobic smear-mongering when it formed the basis of Zac Goldsmith's mayoral campaign in 2016, so hopefully they're smart enough to reject it now that the Tories and their right-wing cheerleaders are using similar tactics to blame Sadiq Khan for the devastating consequences of their own fixation with ruinous austerity dogma.